Greeting you at the front of Newman’s Nursery, this café offers lush views of the plants inside, or sit out in the sandstone alfresco area among the mini citrus trees and feel like you’re on a Mediterranean getaway. The food is locally sourced and often straight from the garden, so everything is fresh and flavourful. You should try: Eggs benedict with its pink beetroot hollandaise is a highlight. Or perhaps you fancy tapas or scones with jam and cream? Seriously, you can’t go wrong. The inner-suburban café strip of The Parade in Norwood is certainly not lacking in quality eating establishments. This quirky find is a welcome addition. Situated next to a bike shop, it continues the cycling theme with wheels propped next to hanging plants on the rock-and-wood walls and modern eco theming throughout. Expect a few laptops on the tables and communal bench-top along with the terracotta pots of succulents. The menu: Chic lunchtime fare you’d expect – sourdough sandwiches and smoothies. Try a wholesome breakfast on the weekend when you’re in the mood for people watching. A stone’s throw from the city centre, Peter Rabbit oozes modern cool factor through every pore, from the mismatched vintage chairs to the vibrant artwork on the walls. Make sure to sit in the outdoor area out the back under the tree’s protective shadow or next to petting zoo with some namesake inspired rabbits. While your food is cooking, bash out a tune on one of the two pianos in the alcove or check out the upended sailboat. Forty minutes’ drive east of Adelaide, past ghost gums and gorges, creeks and roadside apple stalls, you’ll find the town of Woodside. Avalon is the kind of place you’d take your grandma for tea and scones because you secretly love it as much as she does. Elegant indeed: Avalon cafe, Woodside (photo: Rebecca Douglas). It’s quiet, set back from the road and has charm in spades. Inside you’ll be surrounded by nougat, crockery and French provincial-style furniture for sale. Outside, choose from the front or rear courtyard, draw up a wrought iron chair. The signature experience: Hoe into a Hills produce grazing platter or Turkish pide among the magpies, gargoyles and chimineas and rustling leaves. Elegant indeed. 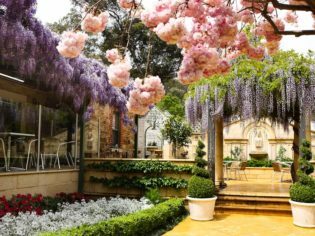 This enchanting café in the Adelaide Hills has whimsy aplenty! Plonk yourself at a rose-patterned table among rainbow pinwheels, leafy creepers and tribe of garden gnomes and feast on one of their massive burgers and a fresh juice. There’s also an eclectic mix of German sausages, local produce, salads, baguettes and noodles on the menu, as well as spiders, caffeinated delights and alcohol to wash them down. Post-meal promenade? : Browse the knickknacks on sale and stroll around the fairy garden dotted with red spotted toadstools and a wishing well. Be sure to take your photo in front of the fairy wings wall. Cute overload! The rear dining room of this funky café in the city’s west looks out over a garden centre’s pansies, hanging geraniums, colourful watering cans and seashell wind chimes. Cashed-up hippies, hipsters and vegans indulge in dishes such as crepes and gnocchi from the cute hand-lettered menu while sitting under the tricycles hanging from the octagonal tent roof. Local philosophy: This place is earnestly local-sourced, seasonal and planet-friendly – the menu describes the commitment to the cause with gusto. Aside from that, it’s a truly beautiful place to be. After your meal, wander down the street for a walk along the beach. Ah, the serenity. Tucked into a side street across from the Central Market, Bliss lives up to its name. While the organic, vegan vibe of the place comes on rather strong (there’s a yoga studio upstairs and shelves of cruelty-free products for sale), even the staunchest omnivore will likely be won over by the Balinese-flavoured tranquility of the courtyard and its big, shady tree. The menu is filled with the requisite wraps, raw power salads and cleansing juices, but there’s bakes and burgers for carb-lovers and fake bacon in several dishes for meat freaks. The bliss test: The reasonable prices, generous portion sizes and kind hospitality (a chalkboard sign proclaims breastfeeding mums are welcome). Best for brunch on a sunny morning. Tucked behind the Adelaide Town Hall smack bang in the middle of the CBD, this unassuming eatery is like an upmarket kiosk for grown-ups set amid heritage churches and council chambers. Office workers converge here for lunchtime meetings, chatting with friends or to flick through a magazine and enjoy some alone time away from the bustle of the city streets. The atrium roof with heaters and clear blinds in winter to keep out the elements, while still affording a view of the gorgeous geraniums, roses and abundant palm fronds. Look beyond: The wholesome, unfussy food, wooden tables and canvas foldout chairs are for those seeking serenity, not Instagram snaps, but this place is definitely worth seeking out. This bookshop and café is only 10 minutes’ walk from the main strip of beachside Glenelg, but feels like discovering the locals’ private literary universe. The musty smells of the second-hand bookstores of yore have been banished, exorcised by the latest hot titles and time-honoured favourites in premium condition. Select a toastie, tea or an old-style soda, perhaps, from the menu (housed in a repurposed Little Golden Book! ), then venture through the various book-lined rooms to the Secret Garden out the back to enjoy it. Brain food: The shop hosts book clubs, colouring-in sessions, writing workshops, high teas and wine nights. It may be quite a hike from the city centre (40 minutes’s drive south, to be exact), but the food at the Barn makes the trip well worthwhile. 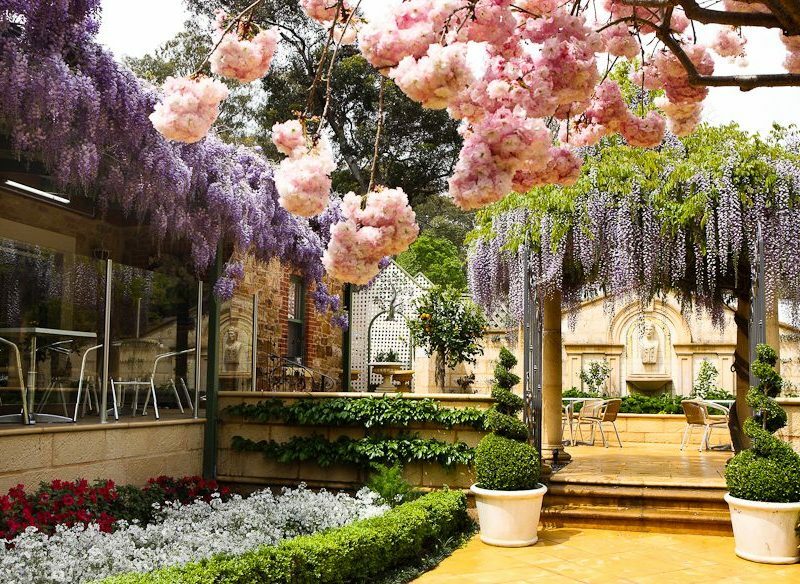 Housed in an unassuming 1840s coach way station along the main drag of the McLaren Vale, you might never guess such an enchanting vine-draped courtyard awaits you inside. Fully heated and air conditioned, you’ll be comfortable regardless of the weather, and bathed in oodles of natural light. Dinner delights: Glass lanterns and fairy lights creating an intimate feel in the evening. Join the well-dressed, well-heeled crowd for a casual drink or an impressive meal, with mains around $30. I can highly recommend Mockingbird Bird Lounge. Stacey and her crew provide a winning combination of written word and a special atmosphere to suit every taste and every occasion. Certainly is a nice spot for a bit of morning calm, Krystal. Wish we were there right now. Espresso Royale Adelaide uses and sells De Groot Coffee, also has a garden, cubbyhouse and a community of small shops within the building. Restaurant review: Peel St – an Adelaide staple?